My mother was a frequenter of Ouija boards by herself. When my daughter was around two, we moved to the town of Cazenovia in upstate New York which is known for in frequent hauntings in homes. I have studied the history. We bought a home. I had a German Shepherd who never ever left my side at night. I'm wondering now when we moved in, my mother was with us so I'm wondering if that's not part of it. We moved into our home. Everything seemed fine. I noticed six dog houses at the back of the property and it had a swimming pool which I never put any water in because I don’t swim and my husband travels. A neighbor came over and said, 'If you're really smart, don't put any water in your pool. Every dog who has lived here has drowned in the pool.' Everytime I would let my German Shepherd out, and it had the round steps so she could easily walk up. My daughter began speaking to a little girl named Lisa. So poor Mishka (the dog), I built a run for her because everytime I would let her out, she would go down to the bottom of the pool and she'd bark and I'd have to carry her out. She couldn't walk out. My daughter was still in her crib, not crawling out at that point. I got her out and put her down one morning and she said, 'C'mon, Lisa.' And I said, 'That's cute, who's Lisa, sweetie?' 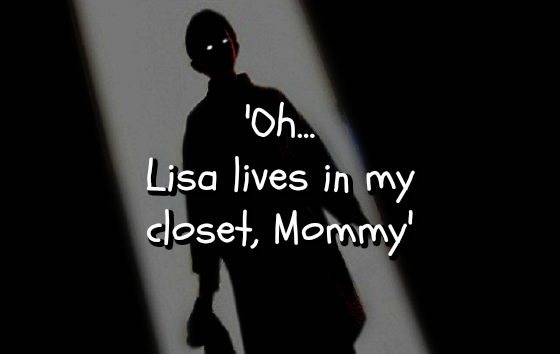 She said, 'Oh, Lisa lives in my closet, mommy.' And I said, 'Well, that's interesting.' I noticed that during the day, around the edges of my daughter's room, around the outside, there was an infestation of flies that would not go away. My daughter started speaking more and more frequently to this little girl, Lisa. My German Shepherd who slept in the bed with me every night of her 14 years would get to the bottom of the stairs in this home and the hairs would go up and down her back and she would not go up those stairs. I started becoming very ill and my daughter started acting in very strange ways. The way she would look at me and study me even to the point where one day I was in her room and, I always took locks off of doors when my child was a baby so she couldn’t get locked in. One night, the door swung closed and she sat there in this trance like state and said, 'Can't get out, can you mommy?' I said, 'Nicole, are you doing this? Nicole, are you doing this?' So I started to pry the bolts off of the door and the door came open. I started sleeping at the end of the hall as I was becoming sicker and sicker. And my daughter was talking more and more to this little girl. I heard singing in the night. One night, I was in the room next to hers and I could hear little footsteps like dancing. I jumped up. I rushed into her room thinking that she's finally getting out of her crib and she was in a dead sleep. I mean just dead sleep. The next morning, I took her out of her crib. She got down. She did a little dance. I said, 'That's cute. Where did you learn that?' And I used to be a newspaper reporter when it was an honorable profession so I'm not an over-reactor. And she said, 'Oh, Lisa taught me that last night.' I will tell you, I freaked in just about every direction one could freak in. At the one point, when the door closed, she fell over in her crib a second time and I could not get her to respond to me. I called a friend of mine and they sent a parapsychologist to our home. When he walked in the front door, my daughter would be fine downstairs on the ground level. He walked in and he kind of caught himself and he said, 'You have 7 to 8 entities within this home.' He said, 'Tell me about the strangeness that your daughter is doing.' I said, 'Well, she's talking to a little girl, Lisa, constantly. But she doesn't talk to her downstairs, it's only in the upstairs.' He said, 'I'll tell you, I looked through the history of your home,' he said, 'there was a little girl. Which is her room?' I showed him. He said, 'Oh please, could we please just leave this room.' He said, 'There was a mother who beat her child to death in this home, and the little girl's name was Lisa.' And I said, 'No, that can't be.' He said, 'No, it really is.' He said, 'Have you noticed any changes in your daughter?' I said, 'I do. She's very calm about things. She would watch me and stare at me as I walked around the upstairs.' He said, 'Get your daughter downstairs immediately. Take her out of the upstairs of this house. I am feeling true evil in the upstairs of this house.' He said, 'This house... are you ill, by any chance?' I said, 'Yes, I've been so ill. It's just difficult to go and change her diapers because I'm so weak.' He said, 'I feel that a spirit is trying to separate you from your daughter and keep her as part of this house.' So I packed her up. I took her downstairs. I left. I just left. I thought, I'm not gonna keep my baby here. I'm not gonna keep her in the house and he made me aware that several other people had bought that home and no one ever stayed for more than a year but they wouldn’t tell anyone why. But being who I was, I said I want to get to the bottom of this. Once my daughter was downstairs, she was fine.